Here, we introduce a new bonding technique that enables the joining of different materials at low temperatures and provides a bond superior to that of polymer adhesives at high temperatures, in temperature ranges between 250°C and 500°C. This technique involves a low temperature sintering process that is termed the “Cold Sintering Process,” where a dielectric composite powder material is sintered to function as the adhesive between two other materials being bonded. In order to characterize and further discuss the potential of this new bonding methodology, which we call Cold Sintering Ceramic Bonding (CSCB), we demonstrate the initial mechanical characteristics of samples with sandwich structures of mesh/CSCB/mesh, including four-point bending, micro-indentation, and adhesion pull tests. Where appropriate, we compare mechanical properties against low and high temperature epoxies and demonstrate that the CSCB matches up competitively with the epoxies at low temperatures and remains strong at temperatures well above those where standard polymer adhesives fail. 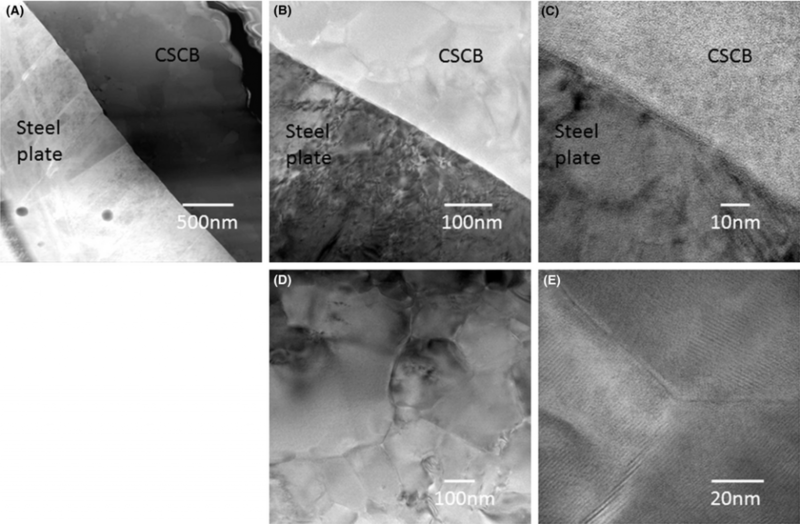 Transmission electron microscopy show a high quality interface between a stainless steel plate and the ceramic after the CSCB. Piezoelectric transformers (PT’s) offer high efficiency in compact volumes compared to their electromagnetic counterparts. In particular, multilayer PT’s can deliver both efficiency and higher power when they are made of hard-piezoceramics. However, hard-piezoceramics usually have high sintering temperatures (~ 1200 °C), which limit the inner electrode of the multilayer structure to precious metals such as silver‑palladium (Ag/Pd) with high Pd content or platinum (Pt). High Pd content or Pt increases device price dramatically and their electrical/thermal performances are not satisfactory for high power multilayer applications. Therefore, two compositions were developed by utilizing a commercially available hard-piezoelectric ceramic (APC 841) and sintering temperature was brought down to 1000 °C or below by keeping essential high power properties at satisfactory levels (mechanical quality factor ~ 1000, planar coupling coefficient > 0.5, and dielectric loss < 0.02). Then, ring-dot step-down multilayer PT’s were prototyped and co-fired with Ag/Pd:90/10 electrodes accordingly. PT’s were able to reach an output power density level of 30 W cm− 3 (Poutput/Volume) with > 96% efficiency (Poutput/Pinput) and a 20 °C temperature rise. In addition, PT’s were tested at higher output power levels and were able to generate 45 W cm− 3 and 60 W cm− 3 with a temperature rise of 40 °C and 80 °C, respectively.